Every Thursday, from May to October, there are local dance demonstrations in the church square of Sant Miquel de Balansat, by Colla de Balansat. For many years, the dances have attracted many members of the public who come to see this live music, the dances and the traditional costumes of Ibiza. While the performance lasts, for three quarters of an hour (6.15 to 7 p.m.), the singers and dancers take the public via a trip through time taking them to the Ibizan rural society. The dances alternate with explanations about the origin and meaning of each dance, in several languages, and also information about the instruments and the men's and women's clothes. The entrance costs 4 euros for adults and 3 euros for children. Traditionally the folk dances were held in farmhouses, at wells and fountains, coinciding with special dates of the festive calendar, weddings, pig killing... The dances follow a definite ritual, set by the different parts played by man and woman. She is submissive, taking small steps looking down on the ground. The man, gallant, takes energetic jumps around the lady dancer, without losing sight of her. La curta, la llarga, sa filera, les nou rodades... are the names of some of the dances. La Colla de Balansat was founded as a stable group in 1965 via an initiative by Antoni Planells with the view to offering these dances during the summer months, and participating in events relating to popular culture, such as the country fiestas on the island and folk festivals all over the world. Sant Miquel de Balansat is one of the villages of Ibiza that preserves their festive traditions best. 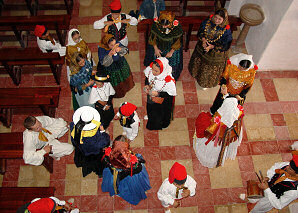 The folk dances, and the patron saint fiestas and the procession of Maundy Thursday, are good examples of this.